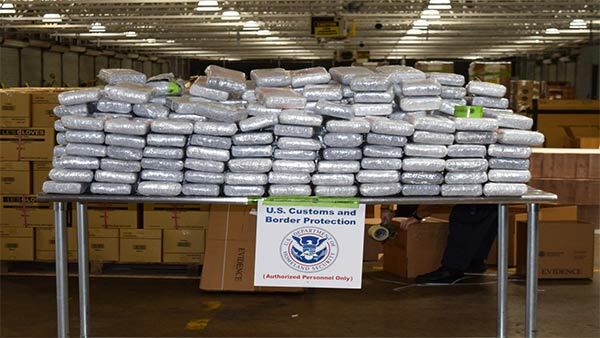 PHILADELPHIA -- U.S. Customs and Border Protection (CBP) officers from the Area Port of Philadelphia recently seized the largest local cocaine load in 10 years when they discovered more than 700 pounds concealed inside cabinets that were shipped from Puerto Rico. Officials said the drugs had a street value of approximately $22 million. This is CBP's 6th largest cocaine seizure, and 10th largest seizure of any illicit drug in the Port of Philadelphia. According to investigators, while examining shipping containers at a seaport in Pennsauken, N.J., on November 2, CBP officers detected an anomaly in one container. They transported the container to CBP's Centralized Examination Station in Philadelphia. Officers said there they emptied the contents of the container and discovered false walls in numerous pieces of furniture bedroom and kitchen cabinets. They said the false compartments concealed 256 bricks of a white powdery substance that field tested positive for cocaine. "Customs and Border Protection knows that transnational drug trafficking organizations will take advantage of natural disasters, and in this case an island struggling to recovering from a crippling hurricane, to smuggle dangerous drugs to our nation's mainland," said Joseph Martella, CBP Acting Area Port Director for the Area Port of Philadelphia.